Your morning coffee? If it wasn’t already mixed with chicory, there was probably quite a bit of sawdust mixed in, with scorched and ground peas, beans, or dandelion seeds for color. The honey in your tea? Sweetened corn syrup complete with wax “honeycomb”. The spices on your table? Finely ground coconut shells, burnt rope, or straight up floor sweepings. The flour in your bread? Mixed with crushed stone, gypsum, or dirt. The brown sugar in your grandma’s cookies? Spiked with ground insects. The scotch in grandpa’s after supper tipple? Poisonous wood alcohol dyed honey brown. The milk in Junior’s glass? Certainly watered down, almost definitely whitened with chalk or plaster of paris, often dosed with a preservative like formaldehyde to keep it “fresh,” and occasionally topped with pureed calf brains to mimic the “cream” on top. The fact that past generations managed to survive their own kitchens was a medical marvel in its own right, and those dark days are only barely behind us. We’ve only made it this far thanks largely to the efforts of one zealous chemist, and a few brave, iron-stomached volunteers dubbed the Poison Squad. As the Trump administration continues to roll back regulations on everything from worker safety to environmental destruction, a new book from Deborah Blum—The Poison Squad: One Chemist’s Single-Minded Crusade for Food Safety at the Turn of the Twentieth Century—takes us back to a time when the very idea of government-enforced regulations was laughable. In 1883, Dr. Harvey Washington Wiley, a chemistry professor from Purdue University, was named chief chemist of the agriculture department. A farmer’s son, he was horrified at the additive-riddled state of the American food industry, and once he assumed his new office, he began methodically investigating food and drink fraud. During the course of his campaign, he became famous for conducting shocking human tests on groups of young men who volunteered to test tainted food products for the good of the nation, and who came to be known as “The Poison Squad.” Ultimately, Wiley won—the landmark 1906 Food and Drug Act was known as “Dr. Wiley’s Law”—but he spent 30 years fighting inside and outside the lab to help make America’s kitchen safer. In doing so, he willingly risked the lives of dozens of patriotic young volunteers, a decision that still raises serious ethical questions. 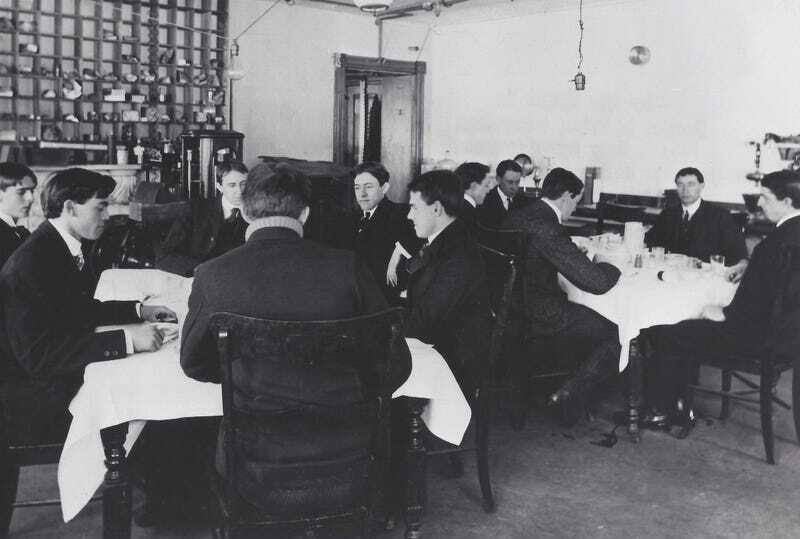 In an echo of modern medical trials, which often draw in poor and working class subjects, many of the applicants for what would become Dr. Wiley’s “Poison Squad” were financially struggling young clerks who responded to the lure of three square meals a day, recruited to test potentially poisonous substances. The volunteers had to record everything they ate and drank, record their weight and pulse rate before every meal, collect their urine and feces for lab analysis, and be examined by a doctor twice a week. When it came time for the Squad to test out sodium sulfate, a salt of the preservative sulfurous acid (a close sibling of the highly corrosive sulfuric acid), the results were grim. Only nine of the twelve members made it to the end, and two became so badly ill that the scientists halted the study altogether for fear of the others becoming sicker. This result alarmed Wiley to no end, and kicked off yet another crusade against toxic preservatives. All of this begs the question: when presented with evidence that so much commercially available food and drink was tainted, why would the government have opposed food safety regulations in the first place? Why did it take a crew of human guinea pigs publicly risking their lives to goad lawmakers into action? The Poison Squad Cook. William S. Carter, who worked at the Bureau of Chemistry and FDA from 1902 to 1946, began as an assistant to Harvey Wiley on the so-called “poison squad” study of the impact of food preservatives on health. He later served as a technician in several laboratories and earned a degree in pharmaceutical chemistry while serving the agency. As Blum also explained, one of the biggest obstacles that Wiley and other food safety crusaders faced was a very American problem: in short, people didn’t want to be told what to do or what to eat—and even if they were literally eating poison, those who opposed these kinds of food safety regulations wanted the choice, dammit! The debate over individual rights versus the common good hamstrung progress in this arena for far longer than was sensible or even reasonable, but, as Blum says, when the 1906 Food and Drug law did finally pass, it established for the first time that the U.S. government considered protecting consumers part of its obligation, a precedent that stands as a landscape-altering moment in this country. As Blum notes, another reason for this divide lay in the States’ continued reliance on capitalist, as opposed to more socialist, modes of thinking, and the government’s often uneasy balancing act between supporting American business and protecting American citizens. Across the ocean, Europe had already gotten a handle on its own food safety strategy well before Dr. Wiley set off on his crusade. Their model was more precautionary—if there is evidence of possible harm from an additive, let’s remove it until we know that it’s safe—than the States’ wait and see if it kills anyone approach, which is why many more additives are still restricted in Europe than in this country. And to be clear, adulterated food and poisonous additives definitely killed a lot of people, from babes in arms to war veterans. Honestly, given the amount of toxins, garbage, and poison that lurked within an overwhelming percentage of American food products during this time, it’s almost impressive that more people didn’t fall ill and die in droves. Chances are that unless they were filthy rich (and even then) your ancestors were eating a lot of dangerous garbage. Were people of this period blessed with iron stomachs? Was there a sort of tolerance to bad food that we’ve since lost, or that has morphed, perhaps, into a tolerance of modern junk food? “I recently heard the medical historian Howard Merkel describe the 1800s in the United States as the century of the ‘great American stomachache;’ contrary to our ideas of rosy-cheeked, farm-fresh health back in the day, people were really not eating wonderfully well,” Blum explains. “Some of that was lousy and even toxic food products, and some of that was the lack of any real understanding of nutrition. And, of course, fairly primitive medicine, including the lack of antibiotics, so people really did not live that long. Average life expectancy in the year 1900 was about 46 years for men and 48 years for women. So not everyone was getting sick at the dinner table, but enough people were that the problem became impossible to ignore, even from the most anti-regulation corners. At the time, the fight for “pure food” legislation was held up as a bipartisan cause, and by and large, the government officials pushing for food regulations were Republicans—ironic now, given modern Republicans’ severe allergy to any kind of regulations at all. These 19th century lawmakers made a conscious choice to uphold their farmer-heavy constituency interests over their own inclination towards coziness with business and market interests, which resulted in the passage of landmark food safety legislation like the 1938 Food, Drugs and Cosmetics Act that created the modern FDA. However, in the ensuing decades, the idea of the government regulating anything at all seems to have shifted firmly into the liberal camp, and the Trump administration in particular stands to undo everything that Dr. Wiley spent his lifetime fighting to achieve. In 2016, Trump told pharmaceutical executives that his administration would cut 75% to 80% of FDA regulations, “at a level no one has ever seen before.” One of his biggest proposed food-related changes would bring the nation’s multiple food safety enforcers like the FDA and US Department of Agriculture (USDA) under the auspices of a single agency—The Department of Health and Human Services (HHS), which presents immediate issues and runs the risk of politicizing food safety in dangerous ways (like for example, causing the outsize influence of powerful meat interest groups to balloon). He’s also pushed through legislation overhauling USDA rules for meat inspection at pork processing plants, which workers fear will lead to a sped-up pace and resultant injuries. In general, the kinds of work environments regulated by the FDA—slaughterhouses, meat processing plants, farms—are generally full of sharp things and slippery machinery, and the human beings tasked with their operation tend to benefit from more regulations, not less. FDA Investigation Targets Website That Mails Abortion Pills to Women in the U.S.